Welcome to the Golden West Motel. You'll recognize us by our tidy appearance and well-kept front lawn on Madison Avenue. We are a clean, up to date husband and wife owned 12 room property. Parking in front of your room will eliminate stairs or a long walk to your room. Outdoor seating will allow you to enjoy the beautiful evenings. All of our rooms have WiFi, flat screen TV’s and DirecTV. We welcome and host visitors from around the world in the summer, and snowmobilers in the winter. Our season is May 5th to March 31st. Master Card & Visa are welcome. A short walk to the downtown area will bring you to hours of browsing in our many gift shops. Or take in the evening visiting the Grizzly & Wolf Discovery Center. Hours will pass as you view the bears in play. An evening drive around Hebgen lake and Quake lake will give you breath taking scenery. Other points of interest include, IMAX theatre, Playmill theatre and our Musuem. So if it's your first time or tenth, enjoy all our area has to offer. 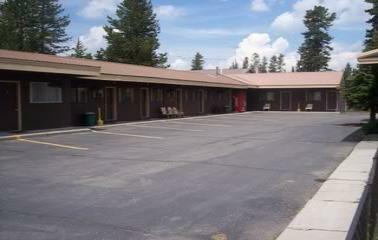 Here at the Golden West Motel we will do everything to make your summer vacation a memorable vacation. In winter, the Greater Yellowstone comes alive with a mantle of snow. Enjoy world class snowmobiling and cross country skiing. Or, enjoy a tour of Yellowstone by snowcoach. Our Location: We're located at 429 Madison Avenue. We're within walking distance of the Running Bear Pancake House (for breakfast and lunch), and just blocks from West Yellowstone’s shopping district and other restaurants.